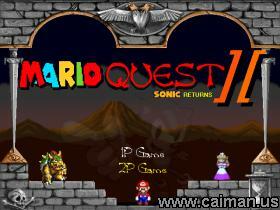 Caiman free games: Mario Quest 2: Sonic Returns by Bowser Technologies. Be warned: this not an easy game! First, you need to select rather you want to play on a saved game or not by clicking on the button of your choice. 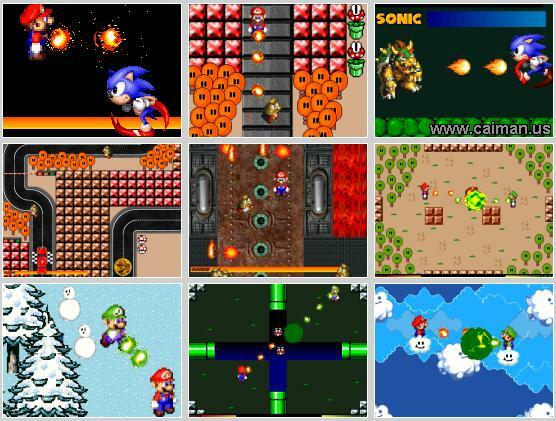 If you choose saved game, your progress will be saved every time you beat a level. 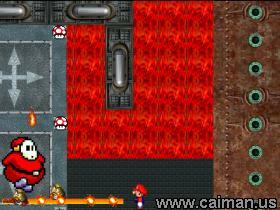 After saving the mushroom world from Sonic the Hedgehog and making friends with his old enemies, Mario decided to help Bowser rebuild his castle. After building the castle, Mario discovers that Sonic has returned! In order to defeat him, Mario and Bowser must team up. So starting Mario's newest adventure! The object of the game is to get through each level without being hit by enemies. When you are hit by enemies, the life bar at the bottom of the screen will go down. When its all the way down, you get a game over. You can gain life back by collecting mushrooms. You can defeat enemies by using your weapon (fire 1/shift), different enemies take different amounts of hits to defeat. Levels require you to do certain things, ex. find a key, collect all the flowers, defeat a boss, simply go through the level, etc. As you progress, the story will be told in cutscenes through the characters' dialouge. If you already saw a cutscene and don't want to see it again, you can press the space bar to skip it and go straight to the action. Through out the game, there are a few driving levels. To make your car go, press the up button. To make it stop, use the down button. Left and right steer. Be sure not to run into walls etc, beause you lose life that way. The controls are pretty much the same as 1 player adventure, and the object is to defeat your opponent with fireballs by lowering his life to nothing. Press C or select "Players" in the menu to change the controls. The default controls are: joystick for player1 and keyboard for player 2.